The Secret of Monkey Island is a re-imagining of the classic adventure game with all new art, new sound, new dialogue from the original cast, and the same swashbuckling story from the LucasArts classic. 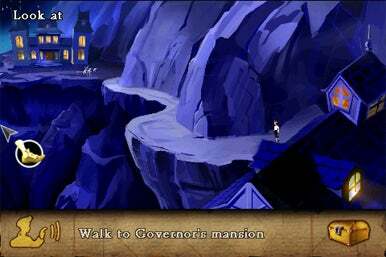 Walk On: As Guybrush Threepwood, you’ll wind up taking a lot of time to get from Point A to Point B in The Secret of Monkey Island. The game—which uses all of the classic Monkey Island conventions such as walking to locations, collecting items and using them to advance the storyline, and spoken dialogue that is sometimes rather theatrical—is definitely a throwback to an earlier time that should appeal to anyone who remembers the original or is hankering for a good yarn. However, adventure gaming is almost completely dead (aka, comatose), and Monkey Island—even on the iPhone—does little to revive it. Granted, the ingredients are here: the game has a great soundtrack with actual orchestra instruments, instead of something an amateur created using Fruity Loops. The story—about a newbie pirate named Guybrush Threepwood learning the ropes of piracy and creating his own legend—is engaging and often funny. At any time, you can swipe the screen to see the original graphics and even play in that mode. Still, part of the problem with Monkey Island is that it’s rare when you want to settle into a game that could take you a week or more to finish. The adventure game constructs are not that compelling anymore—they worked well before the first-person shooter, real-time strategy, and online role-playing genres took over gaming. There’s actually a lot of tedium in Monkey Island. You see some barking puppies, but can’t pass until you find an item or figure out some harebrained scheme to get around them. You see a long mountain pass, and have to wait as your character walks around it. On the iPhone, you can quickly press an option to give an item to another character or speak to a barmaid or collect some loot. In a few cases, you will press on a part of the screen that is not activated yet, which reminded me of the good old days of adventure games that were actually not so good. The iPhone version of Monkey Island does not advance adventure gaming in any way, say by adding a “shake to fight” mechanic or maybe an option for tilting to run away or hide. The key question here is: will you enjoy playing The Secret of Monkey Island? Is there enough to do and see to make it worth your time when there are other games that are more entertaining? It depends. For those who remember the original game in all its blotchy-graphics form, Monkey Island is a nostalgic trip back in time. The new graphics look good, but not outstanding. (One scene in an eerie underworld looked just as blotchy as the original, and there are times when the 2D characters look too robotic.) The sound is great, but there are times when, say, the chirping crickets by an old mansion get really annoying. I’m not clamoring to get back to the adventure anytime soon. I’d rather play more modern games such as Metal Gear Sold Touch, Fieldrunners, or Real Racing. There are some truly yawn-inspiring moments in Monkey Island, but the game does pack in a lot to do and see—you can get lost in the story at times. If you’re bored with adventures game, it would be better to give this one a pass, but if you have fond memories of the genre or are new to adventure gaming, The Secret of Monkey Island may be worth a try—whether in its full $8 version or in the free lite edition.